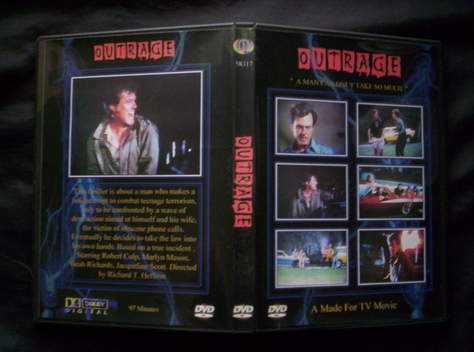 This thriller is about a man who makes a bold attempt to combat teenage terrorism, only to be confronted by a wave of destruction aimed at himself and his wife, the victim of obscene phone calls. Eventually, he decides to take the law into his own hands. Based on a true incident. Starring Robert Culp, Marlyn Mason, Beah Richards, Jacqueline Scott. Directed by Richard T. Heffron. Unfortunately Buy sell community does not offer an automatic check out option. If you are interested in purchasing this item, please send me an email and you will be given instructions to automatically check out using Credit Cards, Debit cards and Amazon payments. this product, ALL SALES ARE FINAL. However, in the unlikely event buyer receives a defective disc, disc will be replaced after the defective disc has been returned. All items ship within 24 hours after payment has been received, via first class mail with delivery confirmation (US Only). Domestic shipping is $3.20 for the first item and $1.50 for each additional item.International shipping is $9.50 for the first item and $3.00 for each additional item.